Newspaper Rock: Indian blood = black myth? By John JurgensenWith a series of specials for PBS starting in 2006, Mr. Gates used a combination of DNA sequencing, genealogical records and celebrity sizzle to "give African-Americans their 'Roots' moment," he says, referring to the Alex Haley novel that cast ancestral identity in a new light. Since his original "African American Lives" miniseries, which explored the heritage of black stars such as Oprah Winfrey and Quincy Jones, Mr. Gates has developed a broader approach—and a TV franchise. Featuring 25 guests ranging from Robert Downey Jr. to Condoleezza Rice, his new series, "Finding Your Roots," premieres Sunday.And the key fact:Mr. Gates says that reveal "always gets an emotional response, positively or negatively." For example, African-American guests are often surprised at how much European blood they carry and their lack of significant Native American ancestry. "It's the biggest myth in African-American genealogy: 'My great grandmother was a Cherokee princess,'" he says, adding, "The average slave and the average Native American didn't even see each other, which makes it very hard to mate. "Comment: I wonder if the myth is equally true for whites who think they have a Cherokee princess in their background. Could be. For more on black Indians, see Thoughts on IndiVisible and People Can't Be Black and Indian? 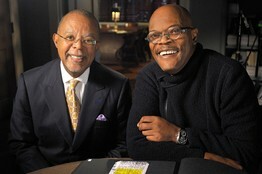 Below: "Henry Louis Gates Jr., left, with actor Samuel L. Jackson on 'Finding Your Roots.'"